Location: California Hi,I hope this is the right section to ask this question. I recently bought a model 307 radio for my 1960 Dodge. I believe this is the Astrophonic model as it has the solid black face and illuminated push buttons. It also has the plug for the optional record player. It has 1960 knobs and doesn’t say “Astrophonic” as the later versions did. The person I bought it from told me it came from his dads 1960 polara. I can’t seem to find any info on the model 307 radio when I search online. Can someone here give me some info on my radio? Thanks in advance for any info. "Dodge radios were transistor based for longevity. The new Astrophonic offered was almost five times more powerful than the standard radio, and it had an extended range and better fidelity. It had three transistors and a rear-seat speaker, along with illuminated push-button controls. 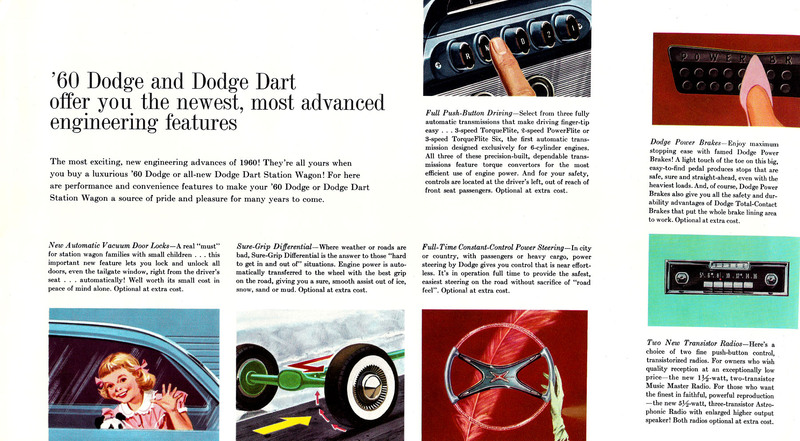 The new Dodge Music Master radio also had push-button controls." Location: Southwest VA Can you provide a few pics to show us what your radio looks like? Hi,Thanks,it’s identical in every way to the mopar model 302 radio shown in the link you attached,mine says model 307 on it though,which is what caused the confusion looking it up. Nothing is shown under that number. I will take pictures this weekend of it. There is no Mopar 307. There is a 302 and a 305 listed for 1960 Dodge. And a few more, but no 307. That’s what I thought too. It’s exactly the same radio as shown under Mopar 302 in 56d500boys reply,yet it is stamped MoPar model 307. I searched online and could never find anything on it so I figured I’d ask here. Any chance it could be Canadian? I’m not sure if they used different part numbers or not. I’ll try and get some pictures this weekend. Location: California What does the 305 radio look like? Was it the mid range radio? Location: Kalispell, MT USA My 334 looks just like that, but has "ASTROPHONIC ALL TRANSISTOR" on the lens. My 334 looks just like that, but has "ASTROPHONIC ALL TRANSISTOR" on the lens. This one is actually a 1963 Dodge 880 radio. The all Transistor models didn't hit the market until the 1963 models. Otherwise they look identical to 1960-61 Polara radios. This info. comes from Rick Hirsch who has done extensive research on Mopar transistor radios. Both the Mopar model 302 and Mopar model 305 were "exactly" the same radio, which were both made for the 1960 Dodge models. Both of these radio models were Transistor-Powered or Transistorized, which its circuitry contained (3) low-voltage space charge vacuum tubes and (3) power transistors. The Mopar model 302 was made by Motorola and the Mopar model 305 was made by Bendix. It was not until 1963, that Chrysler's Dodge Division had started to use an all-transistor car radio model, which was called "Astrophonic All-Transistor" and it was labeled on its radio glass dial. Finally I have "attached" radio manuals for Mopar models 302 and 305. I hope that the above info will help you. Location: Kalispell, MT USA I noticed the Motorola radio has the audio amp transistors visible mounted on the top of the front bezel, the Bendix one does not. You are correct Norm, with the fact that Motorola had mounted their (2) Audio Output (push-pull) power transistors on the top of the radio. Bendix had mounted their (2) Audio Output (push-pull) power transistors on the side of their radio model. When I was referring to the fact that the Motorola and Bendix radio models are "exact" same radio, I did not mean it literally. I was referring to the fact that both Mopar model 302 and Mopar model 305 have used the same front cabinet face plate, tuning/volume knobs, and push button designs. And, both of the Mopar models had also used the same "transistorized" circuitry design, which both had used (3) low-voltage space charge vacuum tubes and (3) transistors. Also, there are some other "minor" differences between the two radio Mopar models in its circuitry design. For example, each one of these two Mopar radio models had used slightly different low-voltage space charge vacuum tubes and transistors complement numbers. And there were also some other "minor" differences in each of their schematic designs, but overall both of these two Mopar radios that were made for the 1960 Dodge models, looks the same and also basically worked electronically the same. Chrysler Corporation had used several different radio manufacturers for supplying all of its car radios. In 1960, the main radio suppliers were Motorola, Bendix, and Philips (Canadian models) for its Dodge Division. All of these radio companies would make the same car radio models, but each radio manufacturer would use different Mopar model numbers. I have "attached" a photo of a 1960 Dodge "transistorized" Mopar model 302-Motorola and also I have "attached" a photo of a 1963 Dodge AstroPhonic All-Transistor Mopar model 350 -Bendix. Note: Both of these radio photos were taken from my archive's reference files, but I do not own them. Finally, "thanks" Norm for your comments and also for sharing the photo of your Mopar model 334 -Bendix AstroPhonic All-Transistor, which is for a 1964 Dodge model. Location: Kalispell, MT USA At least there is enough difference to be able to tell the manufacturer. Makes a difference when servicing them for sure. I liked the Motorola booklet that shows the the model 102. It only has one output transistor, so must have been single ended output instead of push-pull. I wonder how much cheaper it was to buy that kit? I also see the Bendix kit had noise suppressors included. On my 64, my dad had the radio repaired in the 70's, and installed a new speaker. The radio was gone when I got the car back, (I think when I was a kid I stole it for another use ), and the speaker cone had disappeared completely!